Last week was Digital Citizenship week, something anyone associated with a school was likely well aware of. Even those of us with only a tenuous connection had some idea the – do we call it an “event”? – was happening. The overly-large school district for which I used to work and our local high school sent several messages to let us in the community know that they were right on top of teaching kids to be good digital citizens. During that week. I wonder what the focus is this week. Anyway, ignoring my usual cynicism regarding the longevity of focus on issues like these in schools, I’ve always found the concept of “digital” citizenship rather odd. How is the behavior of someone considered a good citizen different in the digital world than it is in the physical world? Has the concept of a “good” citizen changed since the internet? According to the district webpage1, digital citizenship incorporates a collection of nine topics, most of which are hardly exclusive to online activities. I would argue that being a good citizen in the digital age is no different from someone who lived in the previous century. Or the one before that. Certainly the means of communications is different. With instant publishing platforms like Facebook, Twitter, Instagram and the rest of social media, it’s far easier and faster to threaten someone or for students (and teachers) to foul their reputation. But a large part of that list for being a good member of a civil society still comes down to making sure your public actions and statements represent the best of what you can be. As mother used to say, think before you speak. So, do we still teach ethics and appropriate behavior in school, other than during Digital Citizenship Week? I’m sure some of that remains in elementary schools, just from the need to create a working community among kids who are new to the idea. I’m not so sure it continues into secondary schools, outside of the usual collection of rules that every student gets during the first week of every year. And there is tremendous evidence to believe that ethics has been completely eliminated from business and law schools. Anyway, the problem with setting aside one week out of the year to emphasize the traits of being a good citizen, digital or otherwise, is that the issue is minimized or ignored the other 51 weeks. It also sends a message, to both students and adults, that the idea is something we pushed last week. This week we’re worrying about something different. There’s that cynicism about lack of focus coming through again. Image: The Art of Social Media. Posted to Flickr by mkhmarketing and used under a Creative Commons license. 1. Which is not essentially different from many other district and organizational approaches to digital citizenship. 2. I have several issues with the way copyright is usually explained to students and the approach taken here is especially odd. But that’s a rant for another day. Way back in August, before I took an unplanned five-week blog rest, I wrote a post about attending a community presentation by the overly-large school district that once employed me. The assistant super and his associates wanted to explain their plans for an upcoming 1-1 program. I ended that post by saying that I have a lot of questions about the project. Let’s start with one of the most basic queries: Why? Ok, I suppose that’s rather broad. The project page on the district website tries to lay out a rationale so we’ll start there. Students’ lives have changed considerably in how they live, communicate, work, and interact within a globally connected world. Students need both content and skills outlined in the Portrait of a Graduate in order to be successful in the workforce of the future. FCPSOn can support the development of both content knowledge and Portrait of a Graduate skills. That’s it. Hard to argue with anything in that collection of eduspeak, but it really doesn’t answer my original question. Allow me to expand on it. Why will giving every student a Windows laptop2 improve their learning? If every student is carrying a device, does that really lead teachers to create “learner-centered environments” and “meaningful experiences”? Where is the evidence that continuous access to powerful computing and communication technology will result in students leaving high school with those Portrait skills that are the centerpiece of the superintendent’s goals? The rest of the page doesn’t really address any of those questions. But whatever committees3 wrote it worked hard to cover as many different educlichés as possible. Anytime/anywhere? Yep. Collaboration? You bet. Digital citizenship? Of course. Too much time on screens? Of course not. Of course, the simple answer to all these interconnected questions is that technology will not improve learning, make it more meaningful, or improve student skills. Not unless we also make substantial changes to the rest of the learning process. Missing from this page is the substantial issue of how the curriculum will be rewritten to make best use of these “digital tools”. Access to huge amounts of data and information should allow a shift from students memorizing lots of facts and processes to understanding how to organize, validate, and synthesize that information. But that doesn’t happen automatically. The page also claims, as a result of this projects, students will work on “authentic projects and real world problems”. So will that change the primary means of assessing student learning? Most instruction is still firmly locked to the state standardized testing program, not to mention the curriculum pacing guides and the district’s expensive, home-grown “electronic” assessment system. Then there are a few oddities on the page that make me go “huh?”. For example, how students will work on those projects when district policies prevent them from directly connecting with the outside world? And I certainly don’t understand how adding computers to the classroom relates to this supposed effect of the project: “Supporting planning and reflection of student-created goals and teacher-directed learning outcomes”. How are goals “student-created” if “learning outcomes” are directed by the teacher? As I said in the previous post, since I’m no longer in the middle of all this, my ranting here is almost entirely based on the small amounts of information provided to the community, like this project page. I could be completely wrong. District leaders may have already addressed all of my questions and have major changes in the works. I look forward to being shown the errors in my ranting. 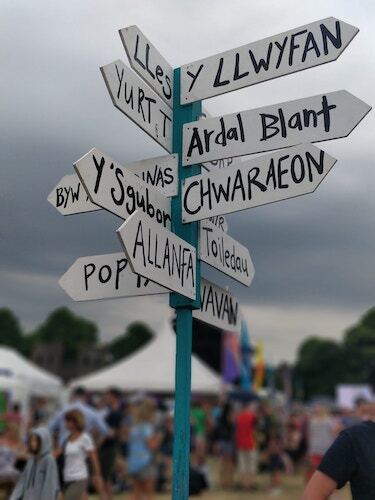 Image credit: Photo of a multidirectional sign post in Welsh by Dave Clubb was downloaded from Unsplash and is used with permission. 1. For those who are not part of the district, some explanation of terms: FCPSOn is the branding name given to the upcoming 1-1 project. Portrait of a Graduate is a collection of skills, divided into five categories, that a student should have when they leave school. It’s actually not a bad statement. Too bad it doesn’t really connect with what is actually happening in most classrooms. 2. I know it will be a device running Windows. The IT department works very hard to stop any other option. 3. I’m very sure the FCPSOn webpage was wordsmithed by several different offices in the district, probably including the lawyers. It has been three years since I left the overly-large school district to set out on a new life as a drain on society.1 Time really does fly when you’re having fun. But the fact that I’m no longer involved in the day-to-day minutia of instructional technology in the system doesn’t mean I’m not interested anymore. I just have to learn about what’s going on in the school district the same way most of the community does. There’s the little bit of education-related information that is reported in the local news, although that’s usually only when something bad happens.2 I can get a little bit of insight from the email newsletter the district sends each week, but that usually reads more like a pile of press releases than any real inside information. More interesting, and probably more insightful, are the tidbits I get when talking to friends and former colleagues who are still working somewhere in the system. Although, in most of those conversations, we avoid discussing work in favor of more fun topics. Anyway, out of curiosity about what has been going on, last spring I dropped in on a community meeting about the new one-to-one computing initiative the district is planning to roll out in the fall of 2019 (with the somewhat bland, focus-grouped title FCPSOn). In my past life I would have been involved with planning this kind of meeting. I was rarely one of the people doing the presentation since my boss knew better than to put me in front of a crowd. I was prone to answer questions honestly instead of sticking to the script. This particular presentation wasn’t much different from those I remember. Planned and edited by teams in several different offices and led by an assistant superintendent who clearly was working from his briefing notes, rather than a firm understanding of the topic. In his opening statement, he told us that they wanted very much to hear from the community and we would be spending most of the two hours on discussion and feedback. He then spent the next 90 minutes running through his slide show or having groups of teachers and students talk about their use of technology. The students involved in these segments didn’t help make the case. Many identified as being part of the IB program at the school where the meeting was held, meaning they were certainly not the “average” kid. And their examples of the great use of technology already in their learning included G Suite, Quizlet, Padlet, and even PowerPoint decks posted to Blackboard as. Missing from the presentations was any discussion about why putting devices in the hands of every student would result in better learning. Nothing about how the district would make changes to the curriculum, pedagogy guides, or assessment as a result of the increased power and capability. As you might expect, there were many references to “personalizing” or “customizing” learning, but nothing about how students would have a direct say in what they learn or how they learn it. The concept of “flipped” classrooms, in which students watch videos instead of teacher lecture/demos, doesn’t do it. As with most of the other examples, flipped is more about changing teaching rather than changing learning. On that topic of student input, I found it interesting that the district-created video about “student voices” was dominated by adults taking about giving students voice. The images of 1-1 classrooms showed students in classic rows or groups of four, with everyone working on individual computers. And the students presenters themselves were obviously carefully selected to make the point of the adults who planned the session. When the assistant super finally finished and asked for discussion from the audience, it was clear the parents and community members (who seemed to be a minority among all the school administrators, teachers, and tech support folks) didn’t want to stick to the script. Many were concerned about the amount of screen time kids were going to get, especially in elementary school. They wanted to know how taking computers home would increase student stress levels. Is it really necessary to give every kid a device to achieve the district learning goals? All very good questions. The assistant super and all his assistants in attendance had few answers, and seemed genuinely surprised by the pushback. Maybe if they had done a little reading outside of the bubble, they might have anticipated it. I have a few questions myself, about 1-1 in general and this particular plan that I never got to ask during this community meeting. But this post has already run too long, so I’ll save them for another rant. I’ll also be digging a little deeper into what happens with the planning and implementation of FCPSOn over the next year, at least as best I can. It will be interesting to see what this all looks like from the outside. 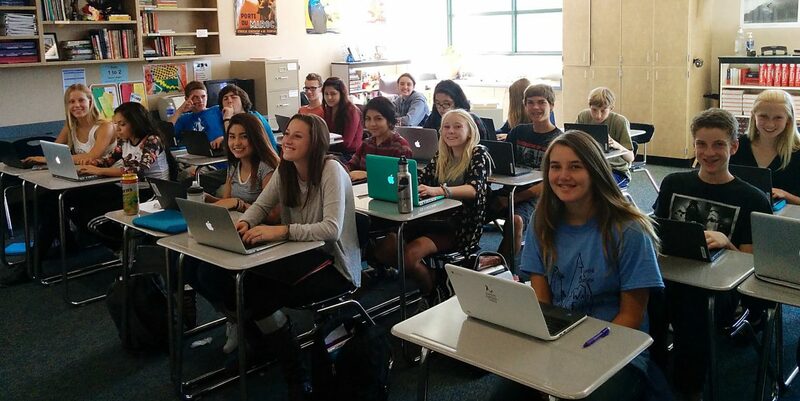 Image of smiling 1-1 students in a Northern Nevada school district, from an article in the local newspaper. 1. That “drain on society” line is how a former Virginia legislator once referred to the teacher retirement system. Fortunately, he is a “former”. 2. Rule number one for anyone working in Fairfax, and I assume the other area districts, is to avoid making headlines in the Post. 3. 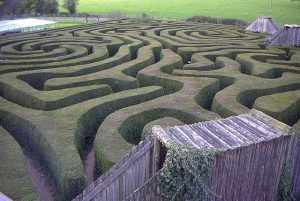 I know the IT department still does not allow student work to be published outside the “walled garden” without lots of review and permissions at the district level.